Throughout high school and college, Damonta' Madden had never been in a classroom with more than two or three other African Americans, so when he started graduate school at Indiana State University, it felt a little surreal to find himself surrounded by students of color. He was accustomed to teachers and peers tokenizing minoritized students, looking to them to represent their entire race, gender or culture during class discussions. That didn't happen at Indiana State. "A lot of times when there are diversity talks in class, everyone stares at the one black student, the one Latino student," said Madden, who received his master's degree in student affairs and higher education Saturday. "But in our cohort, when a person spoke up in class, it was, ‘Oh, that's Katie talking. That's Denzel talking.' Everyone was able to have their own self-authorship because everyone was their own person." 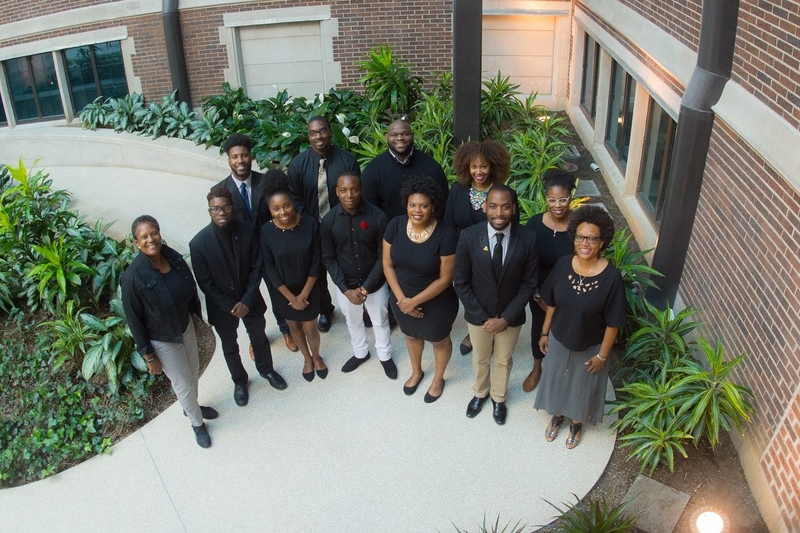 More than half of this year's graduating class in the student affairs and higher education master's program are minoritized students, including 11 African American students who call themselves the "Elite 11." As colleges and universities across the country grapple with how to make their schools more inclusive, the graduates of Indiana State's student affairs and higher education program will take up campus administrative positions, bringing new perspectives and ideas to a predominantly white higher education system. "It's really important because, when you think about who will be coming into our college and university spaces in the next five to 10 years, you can see that it's not just students who are minoritized, but also white students who are astute and aware of inequities in our society," said Mary Howard-Hamilton, chair of the department of educational leadership. "We are preparing our student affairs administrators to effectively have conversations with students so they can speak their justice and have their voices heard." Diversity at Indiana State comes in many forms -- racial, ethnic, gender, socioeconomic, geographical, religious, military status and more. The university has long had the most diverse residential student body of any public institution in the state - and programs such as student affairs and higher education are leading the charge to create an even more inclusive campus. "We already have the most diverse student body in Indiana, but we want to lead the Midwest, at the very least, in being a model of inclusive excellence," said Leah Reynolds, associate vice president for inclusive excellence. Faculty in the student affairs and higher education program have been intentional about diversity in their recruitment efforts. With help from a Hoosier First grant, professors traveled across the state to encourage students from an array of backgrounds to apply to the program. The program's faculty is also highly diverse, which sends a clear message to prospective students about its focus on social justice, equity and inclusivity, said Kandace Hinton, professor of educational leadership. When reviewing applications, faculty also consider each student holistically, rather than looking solely at their grade point average. The makeup of the current cohort isn't just a fad, either. Future classes will also be made up of Sycamores from different backgrounds, which will help diversify the administrative staff at colleges and universities around the country. "Being able to send strong scholars and practitioners into the field who are from diverse backgrounds has the power to be transformative," said Amy French, assistant professor of educational leadership. "It allows undergraduates to see that they can be successful, to not feel like an imposter, to feel like they are supported." As they head out into the professional world, Sycamores will do so having had challenging conversations about race, gender and other identities in the context of higher education and their own lives. One course, for example, encourages students to think about how the physical environment can shape a school's culture -- how many buildings are named after women? African Americans? Latinos? Native Americans? "We don't shy away from the issues," French said. "For white students, students of color and minoritized students in general, there's real value in learning how to have those difficult conversations. Our students are going out prepared to challenge some systems, to have that confidence to say, ‘My voice does matter and I need to speak up for the minoritized students on my campus.'" Madden, who grew up in the foster care system in Michigan, hopes to find a student affairs job working with the foster care population. He also hopes that his presence on campus, wherever he lands, will provide encouragement to minoritized students, African American men in particular. "That gets us through our trials and tribulations when we know someone who has walked the path and can help guide us -- that we don't have to do it alone," Madden said.